The thing about red couches is as “out of the box”as it may seem, it’s usually not and unless you make sure that the construction and lines of the piece are streamlined, it can easily go left. It’s also very unlikely that the person is purchasing the red couch because red is their favorite color or that they are going with a theme that embraces red but more so because they don’t want a boring beige couch. There are soooooo many other options to beige that steer clear of “boring” territory or dreadful red. For those that don’t have an eye for color and design, creating a well balanced room using red as the focal point is hard. I try to steer friends away from it but this time it didn’t work. 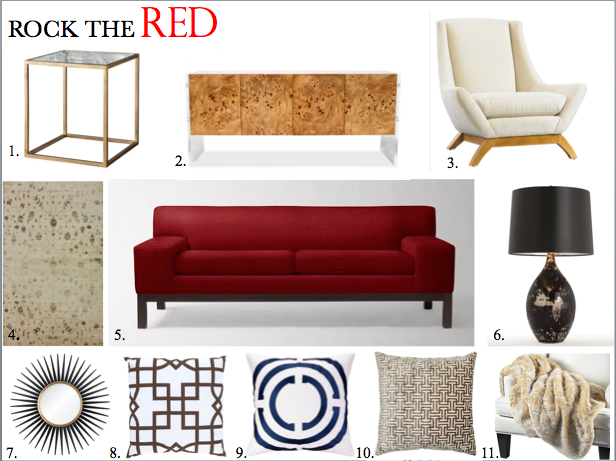 So I put my dislike aside and did some research to find red couches that are easy to design with. So Let’s Rock the Red! Lets start with some couch options. All the below options are from West Elm. I love this manufacturer. The price point are accessible to most and the quality of the furniture great. My personal favorite is the Lorimer. I like the clean lines, deep back, large arm rest and the fact that the overall design of the sofa will lend to a lot of versatility when decorating. I would create a neutral color pattern around it, using additional white seating and infuse pattern and interests through accessories. See my the way I rock the “Red Couch” below. 1./ 2./ 3./ 4./ 5./ 6./ 7./ 8./ 9./ 10./ 11. Tags: Area Rugs, Contemporary, Decorating, Decorative Pillows, Design, Dyed Rugs, Faux throws, Gold, HGTV, Inspiration, Interior design, Interiors, Johnathan Adler, Living Rooms, Living Spaces, Marble, Mirors, Modern, Nate Berkus, Red Couched, Rooms, Sofa's, Street Style, West Elm, Z Gallerie. Bookmark the permalink.